Perhaps someone can ID this as a builder plate on an M-1, or? Where was this typically located? Thanks! of 150 cars (9621-9770) which were built by a consortium of Budd and GE. The earlier M1 plaques read "Designed and Built by the Budd Company" with their logo name. I knew it was from the 150-car option order. GE was the builder of record, with assembly at Erie, car shells built at the Red Lion assembly plant. GE assembled and delivered many at MU units at Erie, but later orders the stainless car shells were built under subcontract by AVCO (Nashville) and Canadian Vickers (Montreal), under Budd license. This included the M-2 Cosmopolitans (base order 1972-74, option order 1975-76), Silverliner IV (1973-76), Arrow II (1974) and Arrow III (1977-78). The last few leftover Arrow III car shells ended up going to Metro-North as the West-of-Hudson (Port Jervis) Comet I-A coaches in 1978. For comparison, here's a GE builder plate from a MNCR M-2 Cosmopolitan. No Budd mention, as the car body was supplied from Nashville or Montreal as noted above. I have yet to see an original Silverliner IV GE builder plate, not sure if any remain. 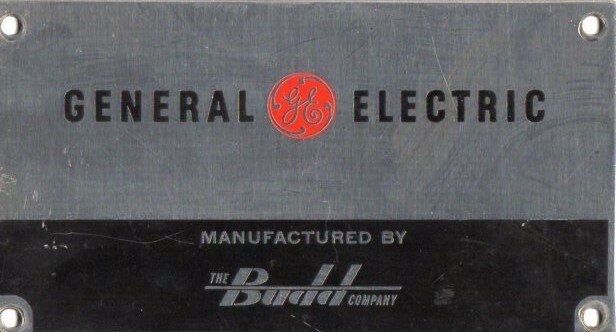 As cars were overhauled, or cab doors serviced and replaced, most of the GE builders' plates were replaced by the earlier style Budd plates, of which the shops had a supply. They were also favorite targets of thieves and souvenir pilferers. The GE plates were rather uncommon in later years as there were no stock of them in the shops for replacement. Last edited by Kelly&Kelly on Mon Jan 23, 2017 6:52 am, edited 1 time in total. Excellent help, folks. Thank you. Someone had one of these GE Plates on their locker when I first started. They took it with them when they retired though. I also was told that there was another plate to the effect of "Rebuilt by Morris Park Shops" I don't know if this is accurate though. When you've said "Budd", you've said it all! The "Rebuilt by Morris Park Shops" engraved plates were put on the diesel coaches as they were refurbished. The shops did quite extensive overhauls on these cars and the quality of the work rivaled that of the builders. Kelly&Kelly wrote: The "Rebuilt by Morris Park Shops" engraved plates were put on the diesel coaches as they were refurbished. The shops did quite extensive overhauls on these cars and the quality of the work rivaled that of the builders. Thanks K&K, that could explain why I never saw one. I had the good fortune to work with a lot of those old timers, many of who were also on the Geritol gang before it broke up. They showed me some M1 cars that they had repaired after significant damage, other than an added weld seam, you'd never notice.